SUMMARY: A look at Joran van der Sloot & William Trickett Smith II, plus prison for gringos in Latin America. 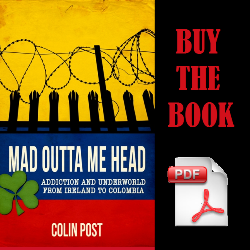 SUMMARY: An overview on narcoterrorism and its lack of awareness in the developed world. SUMMARY: The story of the thief who got into my Medellin hosts’ apartment and stole my laptop. SUMMARY: Short dittie on how security guards work in La Candelaria, Bogota. SUMMARY: Pictures and video of a riot at Colombia’s national university. SUMMARY: Short dittie about my 2nd time busted smoking weed on the street with The Mick. SUMMARY: Short dittie about my first whiff of tear gas during a small riot at UPN. SUMMARY: I discuss the security and militarization climate in Colombia. SUMMARY: The Mick and I got busted smoking a joint in Chapinero. We paid our way out of it. SUMMARY: Luis Blasini from Borrowed Flesh describes a typical day in Tijuana, one of the most violent cities in Mexico.